An exploration of the history of King Æthelbert of East Anglia, beginning with a look at England in general and East Anglia in particular in the latter part of the eighth century. We shall examine and assess what can be deduced of the events surrounding King Æthlelbert’s martyrdom near Hereford on 20th May 794, with special attention to the part played by the Mercian king Offa and his wife Cynethryth.. 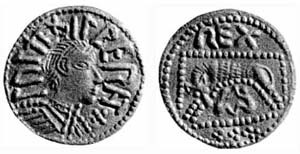 Finally, we shall also consider the later history and extent of the cult of St Æthelbert. Sam Newton was awarded his Ph.D in 1991 and his first book, The Origins of Beowulf and the pre-Viking Kingdom of East Anglia, was published in 1993. Since then he has been researching, lecturing, and writing as an independent scholar in Wuffing and Early Medieval Studies for many years. His latest book, The Reckoning of King Rædwald, was published in 2003. He is also now a Director of Wuffing Education and Time Team historian.